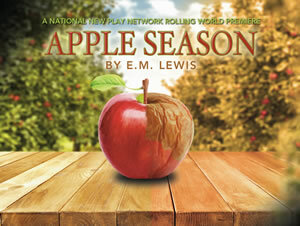 "Apple Season" by E.M. Lewis at New Jersey Repertory Company in Long Branch on 2019-01-18 -- Nobody covers the arts throughout the Garden State like New Jersey Stage! Twenty years ago, Lissie and Roger fled from their family farm and made themselves disappear. But the family secrets haunt them still. A funeral and a question from an old friend send the two siblings tumbling down a rabbit hole of memory and grief, as they try to let go of a tangled past that refuses to release them. "Apple Season" is a A World Premiere by E. M. Lewis. The production is directed by Zoya Kachadurian and stars Kersti Bryan, Richard Kent Green, and Christopher M. Smith.